In the God Speaks Still retreat theme, you’ll find thoughts, ideas, recommended scriptures, activities, songs, and more. Feel free to use the ideas you need and leave the rest…or use them all. As always, if you have ideas to add, please comment in the comment section below the post or send an email to julie (at) lovingchristministries (dot) com. What do you think of when you read ‘God Speaks Still’? A couple of meanings come to my mind… God continues to speak to us even when we don’t think we hear Him and God speaks us to when we are still. Our lives get so busy with worldly things, it’s easy to veer away from listening to what God is saying to us. 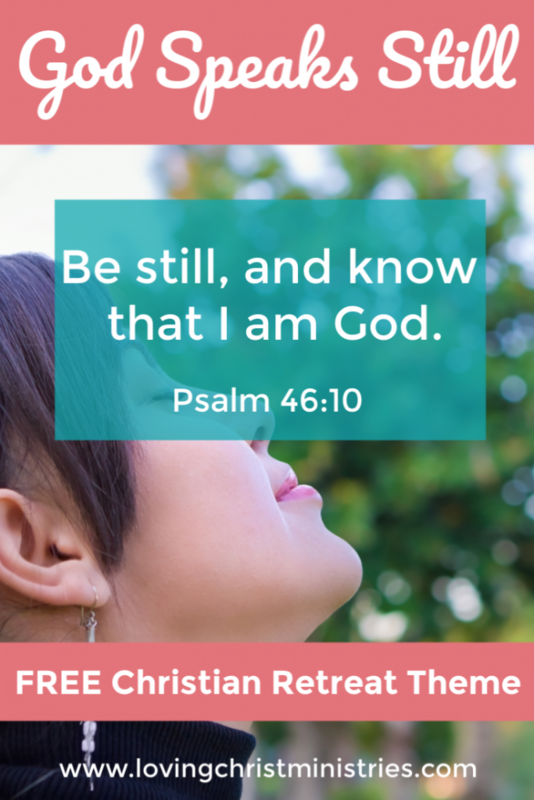 It’s important to take time to be still and focus on Him so we can hear His desires for our lives. Psalm 46:10 Be still, and know that I am God. I will be exalted among the nations, I will be exalted in the earth! Have each person write three facts about themselves on a piece of paper. Then, have everyone crumple of their papers and on a countdown of three, instruct them to throw their ‘snowballs’ at each other. For one minute, let the ‘snowball fight’ continue. At the buzzer, ladies will unfold a snowball and try to find the person to whom it belongs. Then, she will introduce that person to the group, sharing the three facts. Who is your hero? Ask this question and have each person give up to three names of who they consider heroes in their lives and why. Have everyone line up side by side; the first person should come up with a phrase, whisper it in the ear of the 2nd person who then whispers it to the 3rd and so on, all the way down the line. The last person should repeat the phrase out loud to see if it’s anything like it was in the beginning. This is a great activity to facilitate discussion on the layers of life that keep us from hearing God. Ask what layers they have constructed to protect themselves from the world. Discuss specific ways they can immerse themselves in God’s love in order to tear down the barriers and better hear God speak. Ask volunteers to share a special moment in their lives when God spoke to them and how following that message impacted their lives. 1. How do you hear God speaking in your life? 2. What distractions keep you from hearing God? 3. If you hear Him, do you choose to follow what you hear or make excuses for not following what you hear? Provide canning jars (there are options with pretty designs on them), rolls of ribbon, decorate stickers, etc. Have the ladies decorate their jars with their own unique designs. They can take them home and use them to store things in them, such as change, cooking utensils, sewing accessories, etc. Provide a variety of colors of ribbons and beads to create a color coded Bible bookmark. You can use this tutorial as a starting point and then have the ladies use their creativity to make their own unique version. Great resources for women’s ministry! Pinning to come back to! Yes! He does speak today! I’m so glad you took the time to comment. Thank you!